On Tuesday 20 December, the fourth year students of the Degree in Tourism of EU Mediterrani have made a magnificent banquet as a culmination to one of the objectives of the course of Gastronomy and Enology offered by the Degree in Tourism in Mediterrani: the correct organization and Service of a banquet. This course equips students with the necessary skills to manage the preparation of the dishes, presentation, service and cost evaluation. 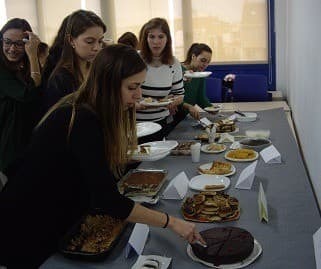 On this occasion the students of EU Mediterrani have set up a complete restaurant inside the center, where each student has prepared a dish cooked from a series of predetermined academic criteria, so that they have been able to taste entrees, salads, main courses of meat or Fish and desserts made from recipes from cuisines around the world.